Even though I have been living in France for 7 years I still crave english food ! I can’t stand going through the day without a cup of tea and when I visit my home country I HAVE to have double cream with every dessert as well as visiting my favourite restaurants, especially chinese restaurants, which aren’t english but my favourite chinese dish (crispy duck pancakes) IS NOT SERVED in France ! I think that if you own a chinese restaurant it should be law to serve crispy duck ! 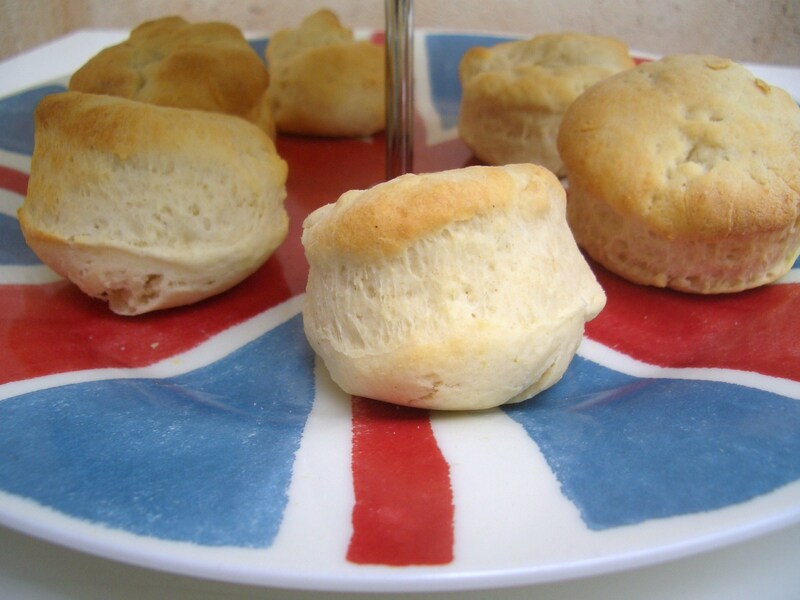 Anyway enough about crispy duck, this post is about scones, which are an english treat sorely missed in our household. 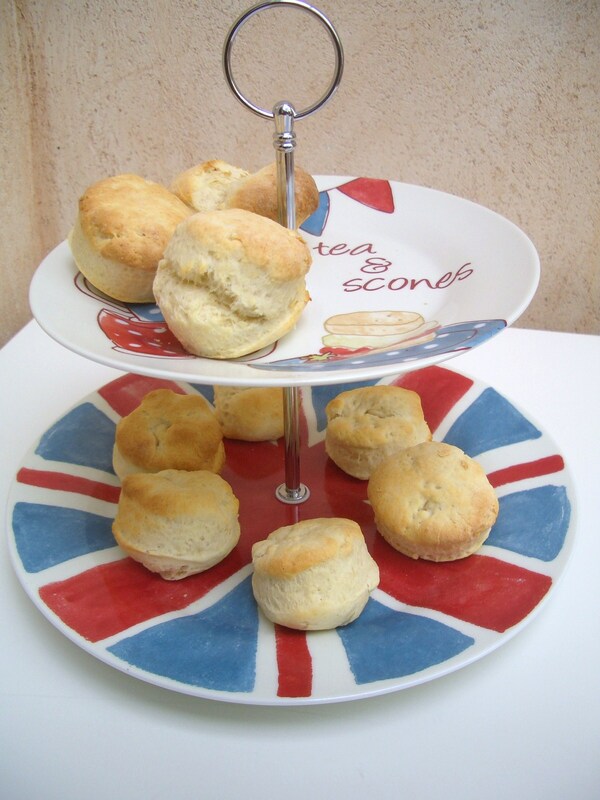 We have managed to get our hands on some clotted cream and I decided to make some scones to go with it. I used Black treacle which… I did not like at all, however, the golden syrup one was gorgeous ! Despite my untidy presentation ! 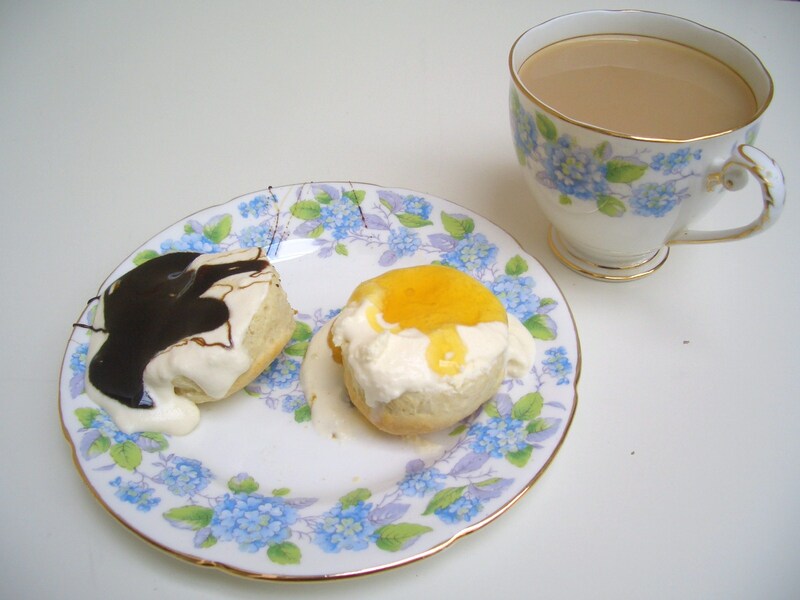 Here’s how to make this gorgeous, english tea-time snack. 1. Preheat the oven to 220 C/gas mark 7/425 F and grease a baking sheet. 2. Sift the flour into a bowl and rub the butter into it rapidly, using your fingertips. 3. Stir in the sugar and salt, then take a knife and use it to mix in the milk, little by little. 4. Flour your hands and knead the mixture to a soft dough, if it feels dry add some more milk. Turn the dough out onto a floured board and roll it out until it is about 2 cm (3/4 inch) thick. Take a 1 1/2 or 2 inch (4 or 5 cm) pastry cutter (I used a glass because we don’t have any ! ), place it on the dough and then tap it sharply so that it goes straight into the dough, don’t twist it unless you want funny shaped scones. 5. When you’ve cut as many scone shapes as possible out of the dough place the scones on a greased baking sheet, dust each one with some extra flour and bake near the top of the oven for 10 – 15 minutes. 6. Cool on a wire rack and eat them as fresh as possible! Posted in Baking, Cooking, Food, Uncategorized and tagged baking, black treacle, clotted cream, Cooking, crispy duck, Delia Smith, double cream, dough, english, english food, golden syrup, scone, tea, thunder and lightning. Bookmark the permalink.